My friends from the Etsy Bloggers Street Team is having a Holiday Sale! 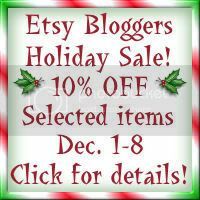 Announcing the Etsy Bloggers HOLIDAY SALE! Buy unique handmade gifts in the comfort of your home-no waiting in lines. Give a gift that says you care. Get 10% OFF Selected items from participating shops. Sale starts 12 AM EST December 1 and ends 12 PM EST December 8. Nahia Creations *Receive (1) lip balm w/purchase of $25.00 or more. Your choice of flavor. Naptime Crafts *10% OFF Store-wide. Orders over $10-FREE U.S. shipping & $2 Canada & $4 International Shipping! Peldyn’s * 10% OFF Store-wide. FREE shipping. Ali’s Adorables * 10% OFF Store-wide. Bravegrrl Clothing * 10% OFF Store-wide. FREE shipping w/purchase of 2 or more items. Sky Girl Style * 10% OFF Store-wide. FREE shipping to U.S.
Bead Cottage * 10% OFF Store-wide. FREE shipping to U.S.
Daibe Beads * 10% OFF Store-wide. FREE shipping w/purchase of $35 or more to U.S.
Aromatic Body Oils * 10% OFF anything on orders of $15 or more. Discount can’t be combined with any other discount program currently available. Sugar Love Honey * 10% OFF Store-wide. We will be adding shops to the list frequently so check back daily for new additions. We hope that you enjoy your savings by shopping with us.